It is now recess, which means MPs have packed up and returned to their constituencies, and it’s school’s out for the academic term too. That means a welcome break for Unite’s activists, who have spent the last seven months touring secondary schools and speaking to students about the labour movement. Attempting to engage young people has been an ongoing objective for the movement. Back in 2011, I wrote for LabourList about how I was touring schools with other young Labour activists to talk about party policies and encourage first-time voters. Because it was party political, we had to team up with the Tories and Lib Dems to offer a balanced debate. But being the governing parties in coalition, responsible for cutting EMA and trebling fees, they soon became disillusioned by the lack of support in the classrooms and pulled out of the project. Now the aims of that project are being realised by Unite with the Unite in Schools programme. Run by Unite Community, they cover a huge amount of ground as union reps visit local schools and deliver presentations. I trained as a Unite in Schools volunteer in 2012, when it was still being trialled. The aim is to address the knowledge gap about the labour movement amongst young people and to use time in the curriculum dedicated to Citizenship Education to discuss the largest democratic force in society: trade unions. When the Daily Mail caught sight of one video Unite produced, it accused the union of trying to “brainwash children”. Safe to say, the forces that wish to see the end of trade unionism were not too happy to see it reaching out. Six years on, I’m amazed to hear how far the project has come. Thousands of school students across the country have engaged in discussions about collectivism and gained practical organising skills. Dave Condliffe, who co-ordinates sessions in the London and Eastern regions, tells me that since September 2017, the team has delivered more than 100 classes, reaching over 6,000 pupils. He has mentored 12 union reps to deliver sessions and takes on some of the larger groups himself. Most of the reps take on the activities on a voluntary basis, but there are several Unite branches that now also offer loss of earnings for members. I joined a session in one school where teachers had clearly been engaging pupils in civil rights movements all term. From the classroom ceiling, t-shirts hung with hand-painted slogans about opposing racism and promoting women’s rights. This group of year 10 girls were a vibrant bunch. Some told us they worked part-time but none could say whether their parents or family members were in a trade union – or, for that matter, what one was. It shouldn’t come as a surprise when we consider union membership among young workers has fallen. Since 1995, numbers have dropped by 2 per cent among 16-24 year olds, and by 8 per cent among 25-34 year olds. At the same time, the growth of zero-hours contracts and casualised labour means the role of trade unions is increasingly vital, as workers such as the heroic McDonalds strikers have shown. Throughout the class, students discover that the minimum wage, maternity leave and their cherished weekends are all thanks to trade unions. They’re shown some famous members of trade unions and are provided with examples of real life campaigns. Engagement doesn’t end with these sessions either. Some schools have gone on to set up a students’ union. 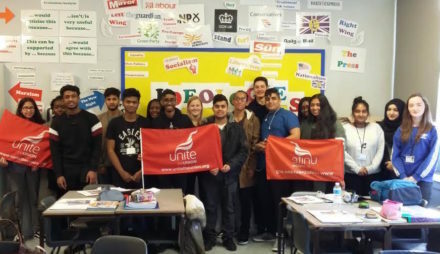 Next month, the Unite in Schools team will be taking students from two schools to Parliament to meet MPs and discuss the ‘Votes at 16’ campaign. As well as whole classrooms, Dave tells me he is planning ambassadors training for members of the school council in relation to advocacy, campaigning and representing the views of others. They will be rolling out ‘train the trainer’ to teachers so they can continue to run the sessions in-house. The most powerful moment for me in the session I observed was at the end, when one senior teacher entered the room and explained to the class that their lunch break was being cut by 20 minutes for the rest of term. After a moment of bemusement, the students realised this was a trick: one requiring an organised response. They planned petitions, protests and a social media storm to oppose the move. With it, they learned vital skills for the workplace.